I’ve been running an absoluteBLACK oval chainring on my mountain bikes since late May 2016. Winter hit, and PhD deadlines hit, and I really haven’t been out on the big bike enough to give you a great impression. My first ride impressions on that chainring still stand – except I’ve adjusted my timing for technical bits and now, well, I just pedal more smoothly with less stress on my old man bones. Now I’ve put in 919 Strava km, so I feel like I can tell you how it’s been working out. You can see here that the ovalness of the 42t ring doesn’t seem extreme, and I didn’t really notice it when I first took it out for a spin. 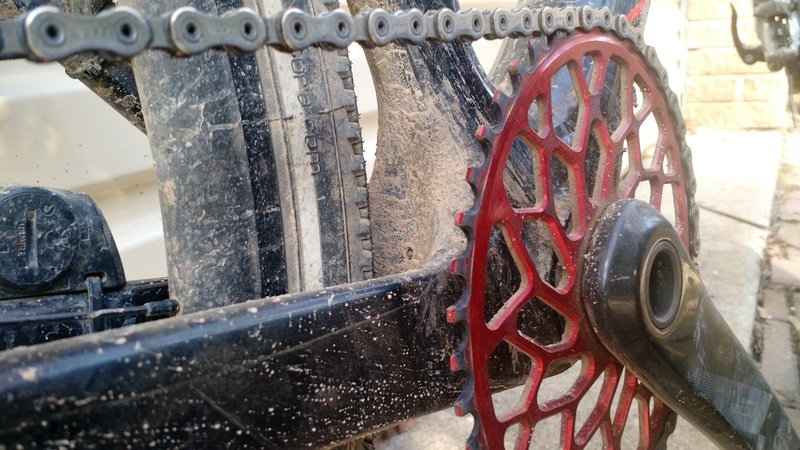 This is likely based on acclimatisation using my mountain bike – but there was, and still is, a subtle difference from pedalling a round chainring. I feel this difference most when climbing. 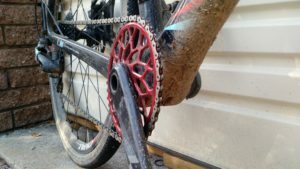 Getting the pedals over the top of the chainring is just smoother – there’s a point where I would really have to push on a round ring, and that spot has disappeared. The end result is that I can hold a cadence for longer up hills, and I’m going to repeat myself a lot here – put less stress on my hips and knees. This is important once you hit 40! So I’m really happy with my absoluteBLACK oval chainrings this far in. My daily drive has become that bit less wearing on my body, and I can steam up hills on a single 42 tooth chainring. The photos at the top show the chainrings in their current state after a relatively normal springtime commute to work and back (yay Canberra). The anodising has stripped from the sides of each tooth, but shape wise the teeth look pretty fresh. I’ve had zero issues with chainring flex or creaking noises, and haven’t taco’ed it yet (yes, I have turned chainrings into tacos… Hefalump!). Performance aside, they are also some serious bling. I have yet to be mobbed in the streets by adoring admirers of good taste in bicycle parts, but I feel that day will come.